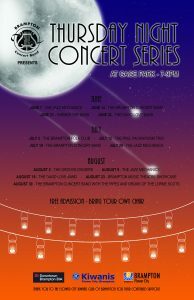 Thursday Night Concert Series is back! The fun kicks off June 7th and runs all the way up to August 30th. Join us in Gage Park located in the heart of Downtown Brampton every Thursday of the summer from 7-9PM.